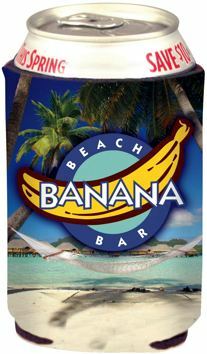 Bulk photo koozies -can coolers, personalized with your photo or logo in full color (unlimited number of imprint colors). Budget Prices in USA and Canada for bulk collapsible photo koozies . Free artwork design. These can coolers fold flat for convenient storage, hold 12-16 oz cans, long necks, & sodas. You may also choose your background color of the photo koozie: see photo. These koozies or custom can and bottle coolers are made of heat insulating foam of the best quality, with fabric exterior and no slip grip. The promotional collapsible koozie provides a highly effective insulation: it will hold beverages cold or warm for a long time. Prices include your full color custom imprint on both sides of the koozie or wrap-around. Very competitive prices and fast production time. 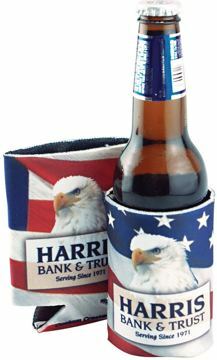 Unit prices below include your full color custom imprint on one or both sides of the koozie, or wraparound. Absolute Minimum: 250. Please contact us for pricing above 2000. PRODUCTION TIME: 10 Days after artwork approval. RUSH PRODUCTION: 5 Days: add 30% to unit prices. IMPRINT AREA: h3-1/2" x3" logo area, h3-1/2"x7" wrap logo area, h4"x8" background. PRODUCTION TIME: 10 days; Rush 5 days production: add 30% to unit prices. Inexpensive Custom Photo Can Coolers -Koozies, Personalized in Bulk in Full Color. Promotional. Budget Prices for USA, Canada.